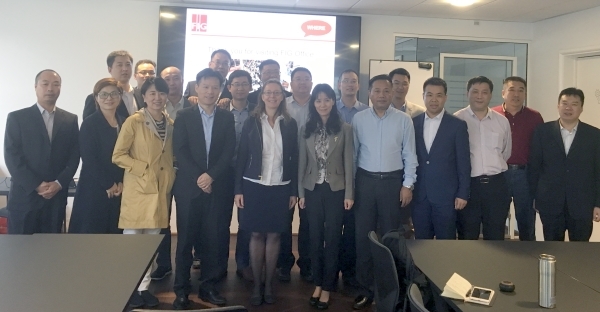 On a cool and windy day, 21 representatives from China paid a visit to the FIG office in Copenhagen. The delegation was on a 10 day visiting tour in Denmark. Under the overall theme Land use planning in Denmark they visited several ministries, governmental agencies, Aalborg University and relevant companies. The delegation had a packed programme for their entire stay in Denmark. Among other things they were introduced to the Danish system for land acquisitions (expropriation) for governments, municipalities and utility companies though construction laws, spatial planning act, sector legislation etc, Land use planning in municipality and local land use plans, spatial planning in Denmark and the Danish land value and taxation system. Hereto there was a focus on the development of sustainable, CO2 neutral and low-energy buildings and cities. The delegation visited FIG office for an introduction to and discussion of the FIG work on Cadastre and Land Management, Spatial Planning and Development, Valuation and the Management of Real Estate. 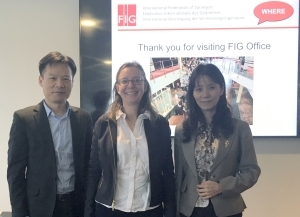 Louise Friis-Hansen welcomed the delegation to Denmark and to FIG. Heads of Delegation were Ms. Zhao Song, Director of Land Price Division of China Land Surveying and Planning Institute, CLSPI and Wu Yupeng, Ministry of Natural Resources. CLSPI is a governmental institute under the Ministry of Natural Resources and is an affiliate member of FIG. The other participants in the delegation represented various provinces and municipalities of China.